Brett McGurk as the next US Ambassador to Iraq? The Envoy’s Laura Rozen citing an Iraqi diplomat and a former U.S. official who worked on Iraq, reports that the White House is expected to nominate Brett McGurk to be the next U.S. ambassador to Iraq. Brett H. McGurk is an international affairs fellow at the Council on Foreign Relations (CFR). Recently an international affairs fellow in residence, he focused his research on legal and policy issues related to complex international negotiations, as well as current U.S. policy in Iraq and Afghanistan. He served on the National Security Council staff of President George W. Bush (2005-2009), first as director for Iraq and then as special assistant to the president and senior director for Iraq and Afghanistan, and President Barack Obama, as a special advisor. During the Obama administration, he also served as a senior advisor to Ambassador Ryan Crocker and then Ambassador Christopher Hill in Baghdad. In 2007 and 2008 he was the lead U.S. negotiator on agreements with the Iraqi government that set the conditions for a withdrawal of U.S. forces and built the foundation for bilateral relations between Iraq and the United States. For this assignment he received the Distinguished Honor Award from Secretary of State Condoleezza Rice, the highest award the Secretary can bestow on a civilian not serving in the State Department. He is a former Supreme Court law clerk, clerking for the late Chief Justice William H. Rehnquist from 2001 to 2002, and in 2004-05 served as an attorney with the Coalition Provisional Authority and the U.S. Embassy in Baghdad, focusing on issues of constitutional reform, elections, and government formation. Brett holds a BA from the University of Connecticut and a JD from Columbia University, where he served as a senior editor of the Columbia Law Review. If true, sounds like what’s old is new again. We’ll be in the lookout for the formal announcement …. 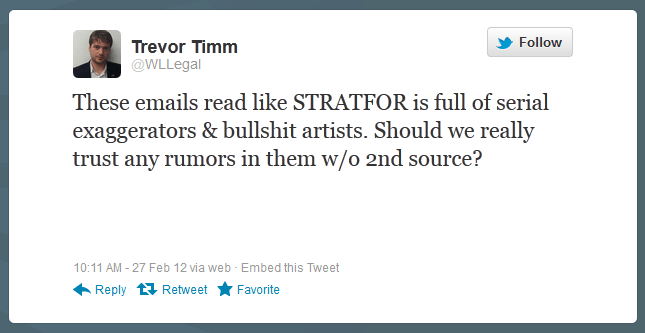 Stratfor Email Leak aka: The Global Intelligence Files — What’s interesting to read? We’ve read through some of the emails on State Department-related topics and though they appear like trivial exchange, there are some interesting ones. Some back and forth on the CIA’s chief of station in Athens, Richard Welch who was gunned down on 23 December 1975 outside his residence in front of his wife and driver in a 17N’s attack. Decades old rumor that Welch was set up by an Embassy FSN. [DSonlineforum] Alledged Leak of 260,000 Classified and Sensitive State Department Cables – shows a state.gov email addy. By the way, Stratfor’s VP of Intelligence is Fred Burton, a former deputy chief of the counterterrorism division of the State Department’s Diplomatic Security Service.